De titel van dit evenement is ontleend aan Lelu Lelu. De Surinaamse schrijver Edgar Cairo zou op 7 mei a.s. 70 jaar zijn geworden. Met zijn ‘provocatieve’ columns in de Volkskrant, met zijn romans, theater en poëzie stelde hij al in de jaren ’80 zowat alle thema’s aan de orde die in recente debatten over blackness, Zwarte Piet, her-denken van het koloniale verleden, white innocence aan de orde komen. Wat is Cairo’s legacy voor de jonge schrijvende generatie van nu? Een lezing, columns, een tafelgesprek. 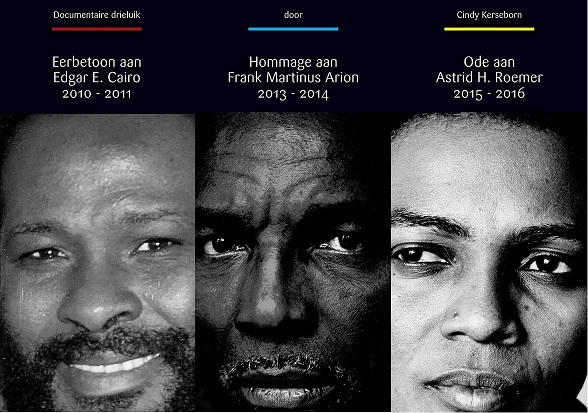 A second session of Black Figures, Black Voices focuses on the work of the Surinamese -Dutch poet and author Edgar Cairo (1948-2000). The evening starts with a screening of Cindy Kerseborn’s (Film Maker) documentary ‘Edgar Cairo: Ik ga dood om jullie hoofd’ (2011), about the life and work of this writer, poet, painter and performer. Kerseborn’s film highlights Cairo’s role as a pioneer in the thinking about a black identity and a black consciousness in the context of the Dutch colonial history and post-colonial present. During this evening, Charl Landvreugd (Artist, Researcher) will read from Cairo’s poems and present a performative lecture that focuses on reading Cairo as theory. In the exhibition space, a number of rarely exhibited paintings by Edgar Cairo will be on display. The program ends with time for questions and a dialogue between the audience, Charl Landvreugd and Cindy Kerseborn. A documentary about the life and work of writer, poet, painter, performer Edgar Cairo (1948-2000). Ten year’s after his death, Cairo’s publisher Frank Knipscheer and his brother Arthur Cairo take part in a revival of interest for Cairo’s disturbing message, as young rappers, singers and writers rediscover and recycle his Surinamese Dutch as an early version of their street talk. In much of his literary and artistic work, Edgar Cairo(1948-2000) focused on the Dutch colonial history of his native Suriname and on the Dutch legacy of slavery. As a black man in the predominantly white Netherlands, race and racial discrimination played an important role in his critical analysis of Dutch society. Cairo was known as an extremely creative writer who developed a proper literary language, mixing Standard Dutch with the Surinamese Creole Sranantongo. Wij ontvingen het droevig bericht dat schrijver Frank Martinus Arion is overleden op 28 september 2015 (Bron: Uitgeverij De Bezige Bij).